Fear is a tricky thing. In the moments we are experiencing it, it sounds a lot like wisdom, and so it’s very easy to pay attention to it and treat it as a friend, without even realizing what’s happening. We can get so used to living with anxiety and worry that we can’t imagine life without it. Fear’s voice just sounds so reasonable! But of course we are called to live without fear. “Do not worry about your life,” Jesus tells us. “Do not be anxious about anything,” Paul urges us. Is this really possible? Can we live without worry? We have to believe that the answer is yes, because God never commands that which he doesn’t also empower us to do. Since we can’t simply stop worrying by tryingto stop worrying, we need to employ indirect effort. What this means is that if we’re going to learn to live without worry, if we’re going to drive out our fear, we need some little steps that we can take, some simple practices that we can embrace, that will allow God to transform us so we can live without fear. I noticed one of these little practices when I was reading about the reunion of Jacob and Esau the other day (Genesis 32). Check it out. Jacob was afraid, and rightly so. He had lied and manipulated his way into the blessing that rightfully belonged to his brother Esau, and then run for his life when Esau tried to kill him for it. He hadn’t seen his brother since that moment, and they had been estranged for years. But now, after a less than congenial parting of ways with his employer/father-in-law Laban, he is returning home, and he’s scared to death of what Esau will do when they meet again. He sends messengers ahead to tell Esau that he is wealthy and can offer him gifts. He hears that Esau is coming toward him, accompanied by four hundred men, and he panics. “In great fear and distress Jacob divided the people who were with him into two groups, and the flocks and herds and camels as well. He thought, ‘If Esau comes and attacks one group, the group that is left may escape’” (Gen 32:7-8). He has exhausted his resources and is facing his worst fears, and it’s in this moment that he finally prays. “Save me, I pray, from the hand of my brother Esau, for I am afraid he will come and attack me, and also the mothers with their children. But you have said, ‘I will surely make you prosper and will make your descendants like the sand of the sea, which cannot be counted’” (Gen 32:11-12). Notice what Jacob does here. He confesses the content of his fear, “I am afraid he will come and attack me…” and then he confesses God’s promise to him, “But you have said…” This is a template for prayer that we can use, too, when we are afraid or worried about anything. 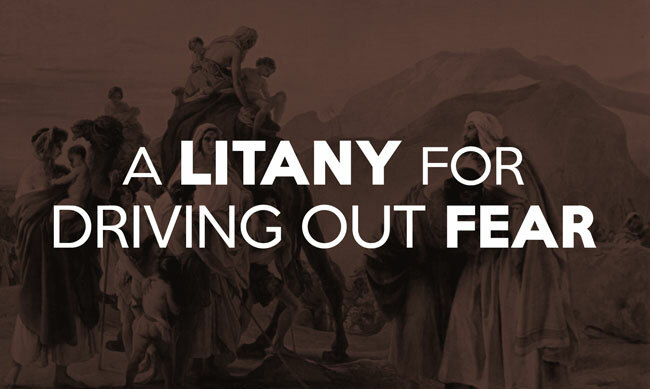 It’s a litany for driving out fear. Instead of stewing on our fears, or trying to “manage” them, we simply confess our fears to God. Here’s what I’m afraid of, God. Here’s what I’m worried will happen. Here are the anxieties I’m carrying. But then we also confess God’s promises to us, inviting his word and presence into our fears. And we find that God’s love begins to drive out our fear, because his perfect love is the foundation of his promises, and that’s always what perfect love does. As we embrace this practice whenever we feel afraid, we find that, slowly but surely, we begin to learn how to live without fear. May God’s love fill your life and drive out your fear!